As a truckwriter, I sometimes grumble when there are no new or improved trucks to drive. In the last two years, I have driven more dramatically new pickup trucks than in any comparable period before, and every indication is that the trend will continue. For those who hunt, fish and embrace the outdoor lifestyle, manufacturers are building vehicles with greater towing power with improved fuel efficiency, acceptance of SAE J2807 standardized towing specs for apples-to-apples comparison, and a range of features for comfort, safety and performance that make these the best pickups ever. It has been seven years since Chevy offered a full range of new trucks. They took a lot of heat for being behind the curve; but loyalists held out, waiting for new vehicles. Enough about “government motors”; now is time to give credit where credit is due. The brand has come roaring back with new trucks in all three categories – mid-size, full-size and heavy duty. In every case, they have heard what sportsmen had to say about performance and features. Every new Chevy truck is more fuel efficient, offers better tow/haul capacity, and looks so much better than its predecessor without sacrificing that iconic Chevy DNA. They have been rewarded with numerous awards including 2014 North American Truck of the Year, Four-Wheeler magazine’s Pickup Truck of the Year, Best of the Best from AutoWeek, Best Fleet Truck of the Year from Business Fleet Magazine, and many others. First of the new mid-size models will be the new GMC Canyon so, for now, I’ll focus on the Silverado 1500 and the 2015 heavy duty models, both of which I have driven — on and off road and with substantial tow loads and payloads. With the Colorado’s larger stablemates, the exterior styling is a very fresh take on the vehicles that Chevy loyalists love. You will still recognize many of the iconic lines but they no longer look dated. Features like an integrated bumper step to access the bed are inspired. The Silverado 1500 offers three all new EcoTec 3 engines, a V6 and two V8s. They include a 4.3L V-6 SAE-certified at 285hp with 305 lb.-ft. of torque; a 5.3L V8 certified at 355hp and 383lb.-ft. of torque; and a new 6.2L V8 certified at 420hp and 460 ft.-lb. of torque. The 5.3L V8 has estimated fuel economy of up to 23mpg highway for awd model. A model equipped with a 4.3L V6 can tow as much as 7,600 lbs., which GM says is the highest for any base V6 in the segment. 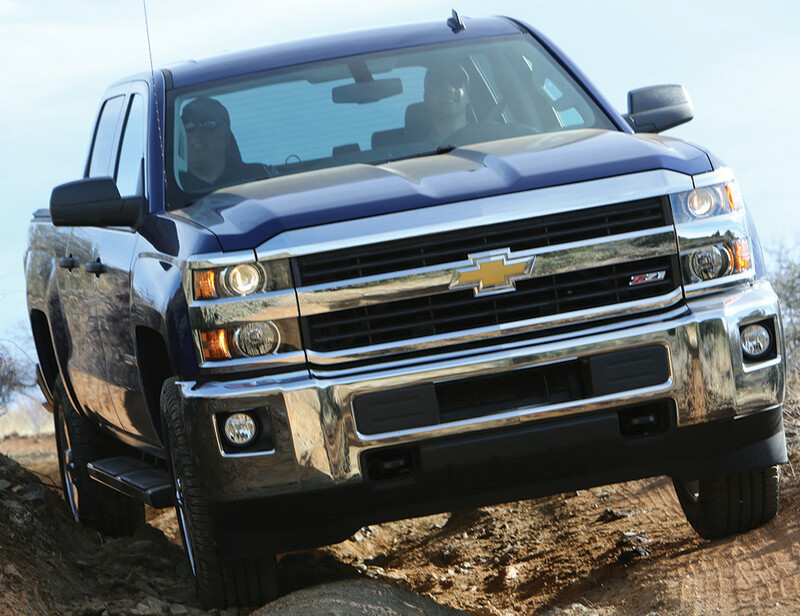 With the 5.3L V-8 and max towing package, Silverado is able to tow up to 12,000 lbs. – more, they say, than any other light-duty pickup on the market. Silverados feature active fuel management via a cylinder deactivator and continuously variable valve timing. The engines also use a compact overhead-valve design and aluminum blocks and cylinder heads to reduce weight and mass for fuel savings. I found the cabin on both the 1500 and the HD to be among the quietest in the market. The redesign includes inset doors, new body mounts, hydraulic body mounts on double cab and crew cab models, and a range of acoustic enhancements that may make this truck the quietest I its class. There are numerous other features for comfort, performance connectivity and safety, but not enough space to list them all. I had a chance in February to do a first drive of the 2015 Silverado HD with executive chief engineer, Jeff Luke. These are workhorses with all new exterior and interior styling that ties them seamlessly to the 1500. Duramax 6.6L turbo diesel and 6.0L Vortec V8 engines are great power players. There will be segment-exclusive safety features and an available Z71 package that includes Rancho monotube shocks (2500HD only) and a range of other features for the sportsman. I pulled several loaded trailers and hauled some mighty loads, and found these trucks to be worthy successors to their much-appreciated predecessors. Again, these were extremely quiet and I felt I never used their full performance capability. An F-Series truck is sold every 42 seconds, and the F-150 is America’s largest-selling vehicle (car or truck) so it should come as no surprise that the upcoming 2015 entry is getting a lot of attention. While I have kicked the tires on this truck, none of us have had a chance to drive it, yet. Ford has won just about every award out there for its F-series, but competitions are generally based upon something new to the market. Watch them in 2015 with their new introduction. As everyone’s pickups improve, Ford has taken a leadership role in materials and weight reduction – both of which lead to improved fuel efficiency and the ability to tow and haul up to 700 lbs. more since the truck itself is lighter, but the gross vehicle weight should be unchanged. 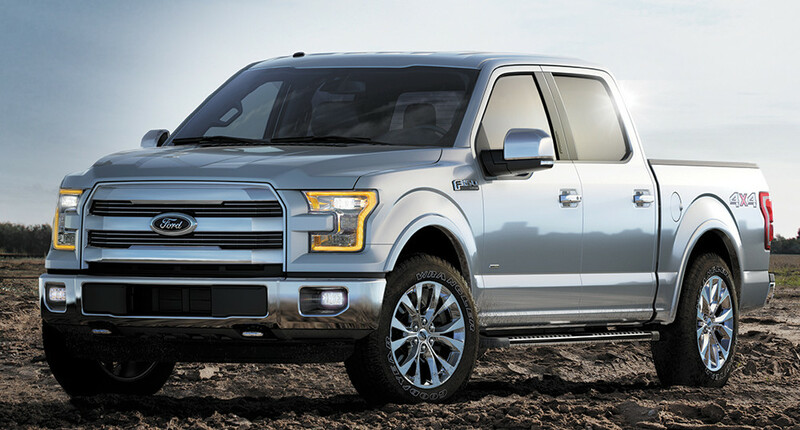 The new F-150 features an all-new high-strength steel frame and aerospace-grade aluminum body panels. And, before you ask, it has withstood testing in real time in sport and work situations for about 10-million miles. Its performance was outstanding and Ford has announced that it will use the new towing standard for rating purposes. Four engines are available including a new 2.7L EcoBoost with standard start/stop technology for cylinder deactivation and a 3.5L V6 engine with twin independent variable camshaft timing. The proven and popular 3.5L EcoBoost AND 5.0l Ti-VCT V8 are also back EcoBoost models will have active grille shutters that aid in engine cooling when open and close to reduce aerodynamic drag at cruising speed. Exterior and interior styling are clearly up to what Ford lovers have come to expect and there is a wide range of features that make this new F-150 a game changer. Emphasis is on safety, comfort, performance, safety and a better solution for connectivity; and all of the trim levels that you know and love will be available. No new King Ranch interior has been shown yet, but I know one is coming. I expect that fuel efficiency, tow and load numbers and pricing info will be available by the third quarter. I also expect that the current F-150 will sell out so, if there is a Ford truck in your future, you may want to check it out sooner rather than later. There are legitimate reasons why so many truck owners love F-series trucks. Among the new features are a 360-degree camera system that creates a bird’s eye view of the truck to help with maneuverability in tight spots and for navigation down narrow roads and trails, with or without a tow load. No mention of F-Series would be complete without mention of F-250 and F-350 pickups. Production began on the current generation of Super Duty in early 2011. At that time, conventional trailer tow ratings were increased by about 1,500 lbs. or about 9%. With 400hp, 800 lb.-ft. of torque, conventional towing of up to 18,000 lbs. and fifth-wheel towing of up to 24,700 lbs. with the 6.7L 2-valve SOHC . At its introduction, the Super Duty accounted for about 50% of all heavy duty sales – dominating the marketplace as it does with the other F-series entries. I don’t know when Ford plans a refresh of its heavy duty trucks – a typical cycle is 5 – 7 years – but I would expect that much of what they have learned on the new F-150 will find its way into the larger trucks, especially features related to better fuel efficiency. A new series of Silverados generally means new GMC trucks, but these new GMCs are not the nearly-identical twins of the past. A commitment to brand differentiation has been a great success. From the front end to the tailgate the new GMCs have their own distinct look, and sportsmen should find it extremely appealing. The 2015 Canyon strongly hints at GM’s desire to redefine the mid-size truck segment which has been dominated by the Toyota Tacoma with the Nissan Frontier as its competition. With the Chevy Colorado, these will be the only mid-size trucks from a US company, and the first in the segment in years. This Canyon appears larger than the typical mid-size. It will have two available engines – a 193hp from a standard 2.5L I-4 and about 302hp from an available 3.6L V6. GMC says this is the best horsepower in the segment, as well as touting the best payload (1,450 lbs. min.) best tow rating (with optional equipment) of 6,700 lbs. minimum, and a Duramax 2.8L turbodiesel. The Canyon looks like the Sierra’s mini-me and that’s all good. I look for an available Denali interior to really tempt buyers who don’t need a full size truck but still want a pickup to meet their sporting needs. No additional information regarding fuel efficiency, pricing and availability have been released, but I expect those in the second quarter of 2014. The new Sierra and Sierra Denali are real lookers. I would call them GM’s most refined trucks ever. GM says that they offer segment-best standard V6 torque and trailering and the best V8 fuel economy – the specifics are mentioned in the Chevy section since the engines are the same. For 2014 there are 4.3L V6, 5.3LV8 and 6.2L V8 power trains. Their features, towing and hauling numbers also match those of the Silverado. The Sierra features four-wheel disc brakes with Duralife brake rotors. This GM-exclusive technology is expected to provide twice the life with quieter braking than conventional rotors. This is another of GM’s super quiet cabins. There are plenty of outlets, sophisticated infotainment and excellent fabrics and finishes. I drove the new Sierra 2500HD and 3500HD models earlier this year and they were among the most luxurious heavy duty trucks ever. They feature everything available on the Silverado HDs, with the addition of more design and interior amenities, particularly at the Denali trim level. Truck buyers waited a long time, but I think the wait was worth it. Again, these vehicles are much more refined than their predecessors so if GMC is your pick for an HD sport truck that can double as a luxury vehicle, you will be pleased. It wasn’t so long ago that Ram stepped out of its Dodge shadow and – to great surprise in some quarters – brought out trucks that impressed almost everyone. Their offering was handsome and robust, but with features that its forefathers had lacked. The 2013 Ram 1500 was a head-turner with unique features, and since that intro the Ram team has continued to add features that set it apart from the competition. In addition to the 3.6tL Penta Star VG-6 which offered 42% more hp and 13% more torque than the 3.7L that preceded it (along with 20% better fuel economy) and the 5.7L Hemi V8 with a raft of features, 395hp and 407 lb.-ft. or torque for better mpg than a turbo V6, there is now a 3.0L turbodiesel with 240hp, 420 lb.-ft. of torque tow capacity of 9,200 lb.. I have driven all of these and they are great performers. The new engine and more refinements brought Ram the honor of being named Motor Trend Truck of the Year for both 2013 and 2014 – a first in industry history — as well as being named Truck of Texas two years running. 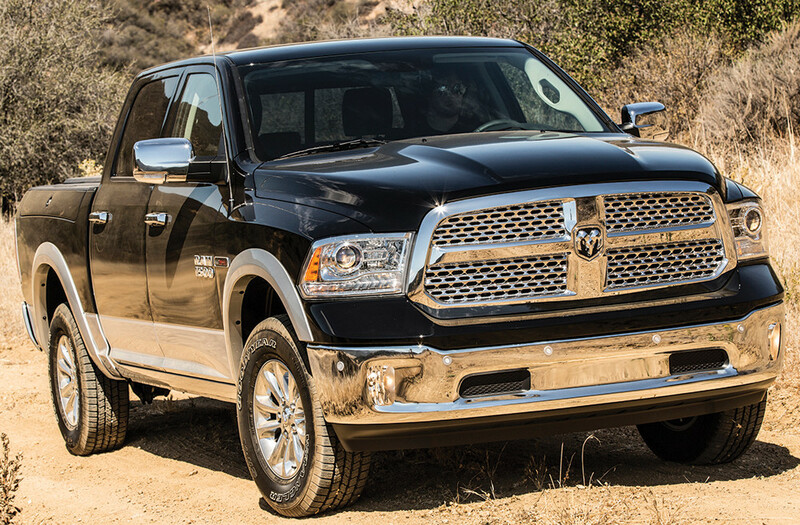 Since Ram brought out its latest round of new interiors, it has competed with the best of them. Today it is the one that many truck makers want to emulate. No wonder. Between its Longhorn (or Bighorn) level, special editions like the Mossy Oak and the well-named Outdoorsman, there is something for everyone and most budgets. Features like Rambox for locked storage of fishing or hunting gear give the 1500 even more credibility. The eight-speed transmission is a winner and the TorqueFlight 8 dash-mounted rotary e-shift is excellent. The air suspension which first appeared on the Jeep Grand Cherokee is genius, particularly for a pickup; and I only wonder why no one ever utilized it before. On the heavy duty side, the Ram 3500 has a maximum trailer weight of 30,000 lbs. attributed to its high-strength steel frame, improved transfer case, higher load transmission, an upgraded 6.7L Cummins turbodiesel engine with 850 lb.-ft. of torque. Its gross combined weight rating (including truck weight, payload and trailer) has been raised to 37,350 lbs., which Ram says surpasses everyone else. It deserves its Power Wagon identity and HD Truck of the Year awards from The Texas Auto Writers Association. 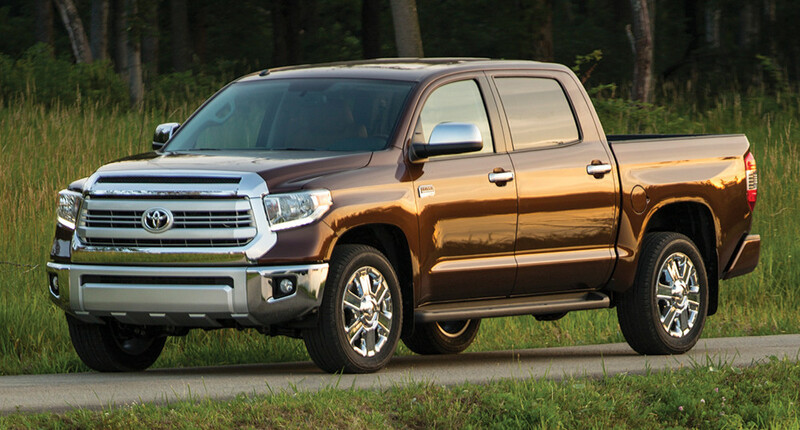 The 2014 Tundra – the first major redesign in seven years – will please Toyota lovers and truck enthusiasts who have been put off by its appearance. The exterior and interior changes and upgrades – particularly the inclusion of the luxury 1794 and platinum editions – should put it on more “check it out” lists than ever before. The three engine/powertrain options that have been available in years past are still available. Toyota describes its workhorse as the 5.7L, DOHC i-Force V8, with 381hp and 401 lb.-ft. of torque. A 4.0L dual overhead cam V6 with 270hp and 278 ft.-lb. of torque is standard on regular and double cab SR models. It is paired with a five-speed automatic transmission with uphill/downhill shift logic. The 4.6L V8 offers 310hp and 327 lb.-ft. of torque. In all cases, no changes have been made in transmission for these engines from the 2013 model. Max tow capacities and GVWR have been increased, however, and, in a tip of the hat to Toyota, all tow capacities are already measured against the SAE J2807 SAE towing standard. At higher trim levels, Tundras have the kind of luxury amenities that might be expected from Lexus, its high end car sibling. On the outside of every new Tundra there is a new chiseled look with distinct character lines that define their trim levels. A new hood and grill, a three-piece bumper design (less expensive than replacing an entire bumper) and squared-off fenders and wheel wells look more refined than ever before. It is expected that the introduction of the 2014 Tundra is a precursor to the introduction of a new Tacoma – upgrades and new features will keep it highly competitive against the new GM mid-size vehicles. This is particularly meaningful since Tacoma dominates its segment with about 67% of the current market. Tacoma owners are among the most loyal in the sport truck market. I expect Toyota recognizes that a diesel to up the tow capacity and torque at low speeds is extremely important although, like all truck makers, they won’t discuss future product. Another tip to an upcoming vehicle redesign is that only an appearance package and Entune audio were added for 2014. The available engines are a 2.7L DOHC four-cylinder offering 159hp and 180 ft.-lb. or torque and a 4.0L DOHC V6 with 236hp and 256 lb.-ft. of torque. Both have variable valve timing with VVT-I intelligence to provide stronger low-end and mid-range torque. The V6 can be paired with either a six-speed manual or five-speed automatic transmission. The four-cylinder can be mated with a five-speed manual or four-speed automatic transmission. When equipped with a V6 tow package, access cab models have a SAE-certified max tow capacity of up to 6,500 lbs. In their 4×4 TRD configurations, Tacomas are great sport trucks where a smaller vehicle meets your criteria for off-road performance. It would be impossible to list all of the features and available sport packages that are available for the Tacoma, but this is an outstanding mid-size truck for others in this growing segment to be measured against. Nissan has many loyalists for its pickups, but both the current Frontier and Titan have been in the marketplace longer than they should have been, and Nissan knows it. 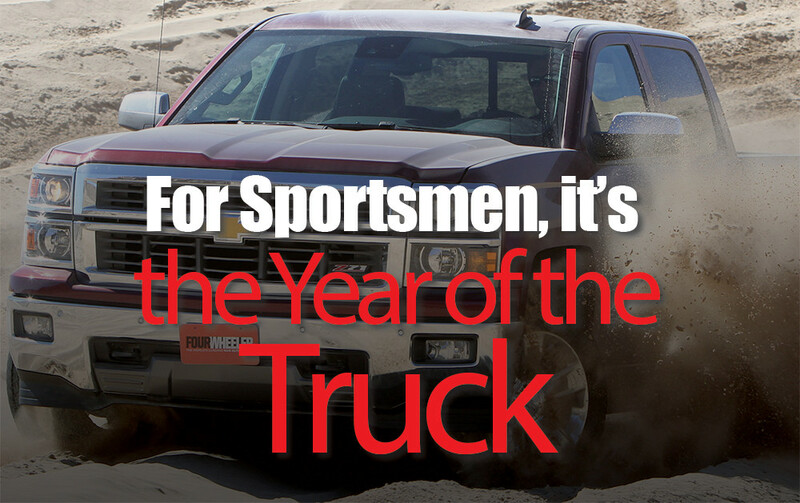 It’s no surprise to Nissan that truck buyers feel discouraged but there is good news for sportsmen on the horizon. Rather than beat a dead horse, I’ve decided to give you a look at how Nissan is approaching new trucks for 2015 and 2016 model years. The current Titan is a no nonsense pickup already with an all-aluminum 5.6L V8 engine rated at 317hp and 385ft.-lb. of torque. Its 5-speed automatic is designed especially for truck use with emphasis on serious towing and smooth shifting. The PRO-4X is a rugged off-road performer and it features a range of standard and optional equipment to meet most needs. I can assure you that Nissan is looking at the Titan as a sport truck since they announced an initiative at the Shooting, Hunting and Outdoor Trade (SHOT) show in January. They have asked 2,500 outdoor journalists to provide input into the next gen Titan, by submitting a video or using social media to identify their ultimate outdoor adventure. We will know much more by summer. Already announced by Nissan is the inclusion of an optional Cummins 5.0LV8 turbodiesel with a torque rating in the mid 500 lb.-ft. and more than 300hp. That redefines the game for Titan and is a clear sign that they are serious about their new truck offering. Look for a new Titan second quarter of 2015. The Frontier is not being left out of the mix either. At the Chicago Auto Show, it was announced that a Cummins 2.8L turbodiesel with almost 200hp and more than 350 lb.-ft. of torque is being tested out on mules – those are current vehicles with new technology under the hood. The technical study for this new engine shows 35% better fuel economy than the current V6 4×2 Frontier. Fuel efficiency has always been an issue for Nissan and they are addressing it now. 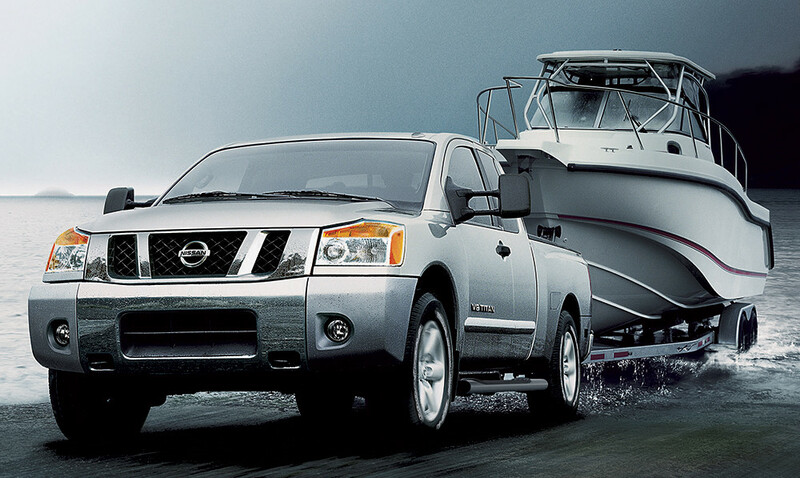 Today’s Frontier garners a lot of love with its choice of a 4.0DOHC V6 (261hp, 281ft.-lb. torque) and a 2.5L inline 4-cylinder for the 4×2 King Cab only. As with the Titan, there is a full array of bells and whistles, and the PRO-4X packages make this continue to be an exciting off-roader. New Nissan trucks could be game changers, especially among the loyalists. They know how to handle off-roading, now let’s see some major tow capacity, hp and torque to be game changers.